This year marks the 83rd annual Strawberry Festival at the South Bay Grange in Olympia. Historically strawberry fields surrounded the South Bay Grange. "The fields are gone, but the community continues." Join us as we start the celebration with our Strawberry Short-K 5K Run/Walk. Our route begins at the South Bay Grange and continues in a flat loop that returns by way of the beautiful Chehalis Western Trail. Our first place finishers in each category will receive a complimentary Strawberry Shortcake with all our runners enjoying fresh berries at the finish. Additional prizes will be awarded, in a drawing, provided by our fabulous sponsors. In partnership with NTHS Boosters, the proceeds from the race wil benefit the teams that the volunteers come from. 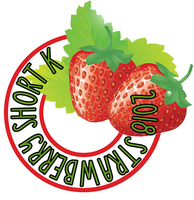 Fundraising from the Strawberry Festival supports children's theater during the summer through www.bkmusicalproductions.com. Sign up today and we'll see you at the Festival! A Tech Shirt can be purchased separately at the time of registration, however only a limited number of shirts will be available to purchase the day of the race. If you want one, order early! Last day to register online is June 14, 2019. Registration the day of is $30. Last day to order a Tech Shirt is June 1, 2018. A few shirts will be available the day of.